Easy to make bongs. Learn how to make a homemade bong. Learn How To Make A Bong. Build easy to make bongs in a few simple steps, with different varieties of materials. You can easily learn how to make a bong if you have the correct bong parts, and some determination to smoke. Here at the marijuana effect we are going to show you how to make different homemade bongs that are fairly safe, but ultimately get you medicated. You can decide for which is the best way to make a bong. 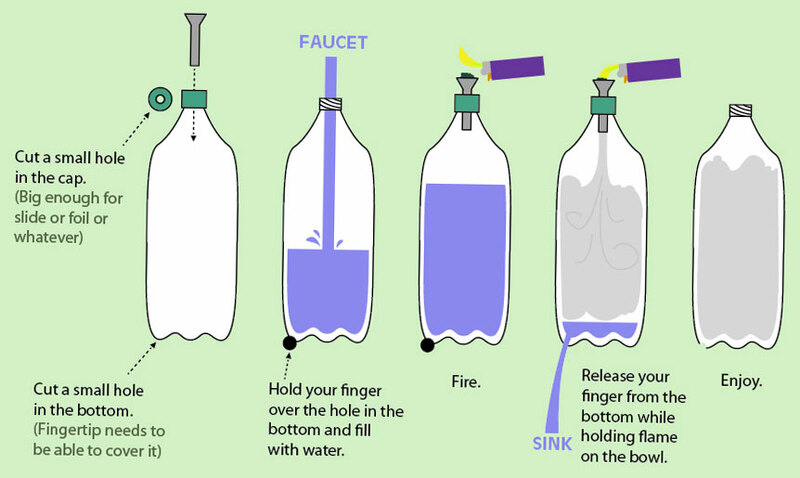 The most efficient way we recommend how to make a bong is to build a gravity bong. Gravity bongs rely on the reverse air displacement of a large bottle submerged in a bucket of water. We would only recommend this if you are daring because it is very potent and, it comes with very intense marijuana effects. Click the link below to see full version of how to make a gravity bong. Another easy to make bong is the reverse gravity bong. It is the complete opposite of the gravity bong above, yet it is similar, and easy to make. 1. A bottle no smaller than 20 oz. no larger than a 2 liter. 2. Metal insert for bowl piece, or small bowl piece for bong. 3. Pen to poke hole at the bottom, water, lighter, and herb. 1. Find a decent sized bottle, not too big, but reasonable, and construct a bowl piece out of the cap. FURTHER INSTRUCTIONS2. Clean the out bottle completely, and poke a hole the size of a pencil eraser at the bottom of the bottle like the picture above. 3. Pack yourself some herb in your easy to make bong cap, plug the hole tightly with your finger, and have a friend fill it to the top with water, then cap it off. PACK A BOWL4. Make sure you are in a place where you can dispose of the falling water. The best place is outside, and in a sink or bathtub. 5. Have that same friend light the herb up as you release your finger from the hole. Water should rush out, and smoke should come swirling in. Remove the cap when the water has drained, inhale, smoke and experience the marijuana effect. What an easy to make bong!